Creatures™ Creature Food Jelly Cup | Zoo Med Laboratories, Inc. Variety pack of three unique flavors that insects love. Flavors include Banana, Brown Sugar, and Nectar. Simply peel the lid and place the cup in your pet’s habitat. Cups Fit perfectly in the Creatures™ Glow-in-the-Dark Rock Dish. 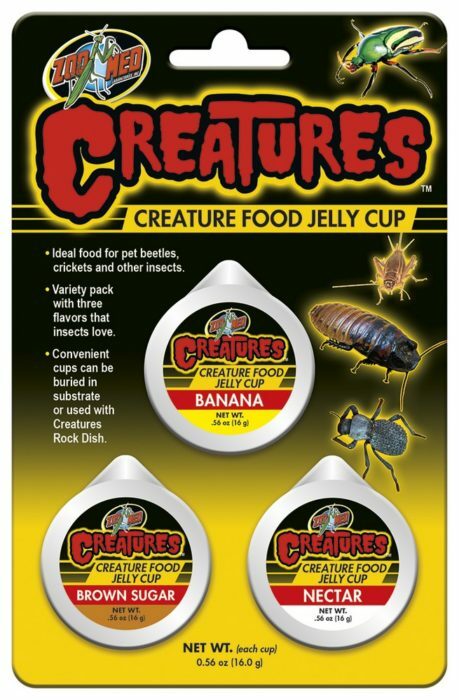 Ideal food for pet beetles, crickets, and other insects. Variety pack with three flavors that insects love. Convenient cups can be buried in substrate or used with Creatures Rock Dish.